Exposat: The theme is based on pieces and images suggesting how time and space can be re-presented. The title ‘EXPOSAT’ is an acronym of the phrase ‘EXploring Perceptions of Space and Time’. This is also a Catalan word meaning ‘exposed’ and is linked to ‘exposar’ – expose (reveal, uncover) which is a nice coincidence. The pieces are intended to portray one or many moments in time and space. These images or sequences are intended to reflect events, structures and processes and our perception of them. The objective is to provide experiences that link to the model of events in space / time that the pieces are intended to suggest. 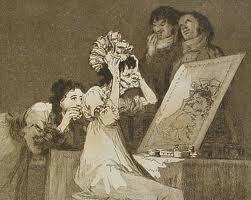 The intended mood of the exhibition is to portray interesting and perhaps novel ways of achieving this. The theme allows for exploring different techniques to capture moments in time and space and to record and present them and the linking of these to create a dynamic process of perception and re-perception. ‘There are things known and there are things unknown, and in between are the doors of perception’ Aldous Huxley. ‘The moment a person forms a theory, his imagination sees in every object only the traits which favour that theory’ Thomas Jefferson. 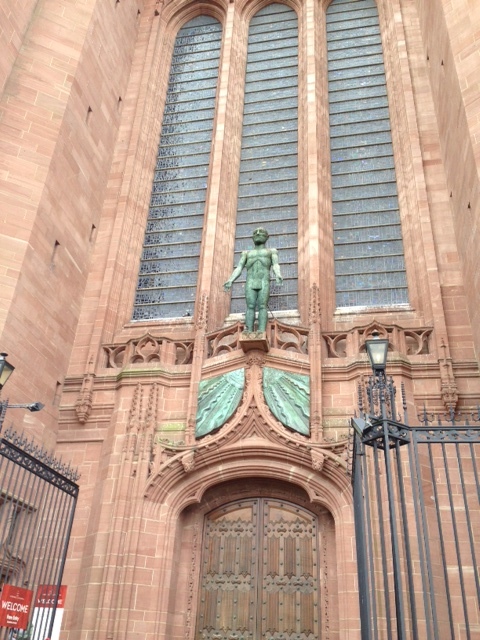 Whether the quote is religious or not, whether the man on the front of the cathedral is Christ or not, when approached openly, the viewer is the one to benefit. 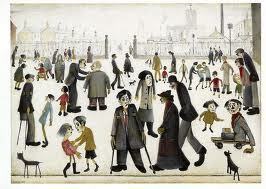 The current Lowry exhibition at Tate Britain in London is brilliant and moving. The title of the exhibition is ‘Lowry and the Painting of Modern Life’ and I had no idea just how modern his works are. They are timeless because sadly, the struggles of people that he paints are still present. I guess it is down to the individual as to how they interpret these paintings but it is hard to see them within their own time only – they go beyond. They show working class people on their way to work, events such as a football match, or children coming out of school. They don’t show intricate detail but the paradox of this is that they show it all: less is more. Lowry saw drama in the everyday – in crowds and people together. 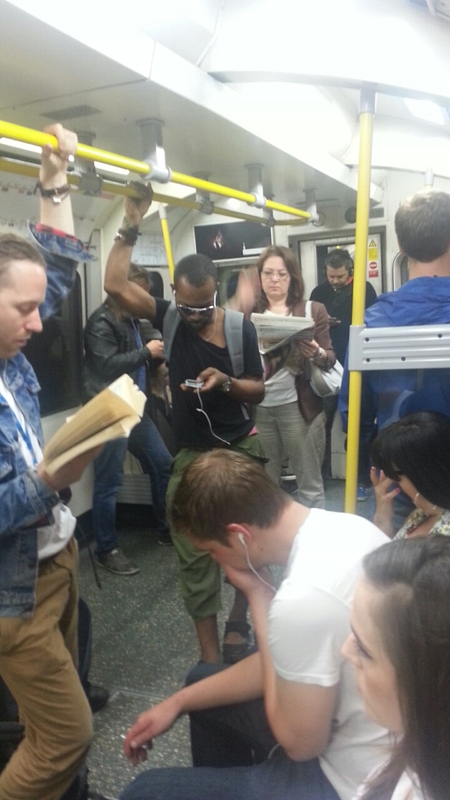 In the picture above, people are leaning forward to show they are on a mission to work – not unlike today. 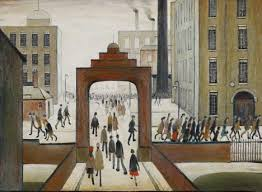 What you get with Lowry is the backdrop of the poverty in the North of England at the time which you might not see so easily in the paintings that are being done today of a city in Britain but it doesn’t mean poverty of spirit is not there. Let’s face it, when you smile at someone on your journey to work these days (especially in London), how often do you not get a look in return that looks positively puzzled? – unfortunately communicating nicely is not the norm these days and we know that years ago – at the time of the two world wars – people had less, but there were fewer choices and somehow sticking together seemed easier. You were equal to the next person – these days it is all about being better. Yes, Lowry’s paintings are gloomy – they are beautiful but the beauty shows us the problems and suffering in society. We rarely see details and Lowry was not interested in communicating sentiment but his paintings show peoples’ struggle in life whether he wanted to show this or not. His paintings are life as it is and his landscape paintings are not unlike the war paintings of Nevinson and his contemporaries – Lowry’s landscapes show stark chimneys and mills – buildings which have overtaken the people that operate them. There are all sorts of parallels you could draw with his work and the work of the Vorticists who were part of the anti-Futurist movement and believed that the technological machines of the war were the indication of what was to come. …and is as meaningful today as then. I wanted to say a big thank you to all the bloggers who’ve looked at my blog during its first year. I’m grateful for you stopping by and hope you’ve got something out of it. Thank you for your messages of support and interest. Like all of you, there is something liberating about speaking into the midst of humanity even if like Amy Adams in the film ‘Julia and Julia’, I don’t always know who I am speaking to. If you think you’re too small to be effective, you’ve obviously never been in bed with a mosquito. Lots of small acts make a big difference. One person can’t change the world but one person can change the world for one person, or one animal. We write a script for ourselves that sits within us – we probably don’t know we do, and we often use the wrong words or write the wrong story. There’s an internal monologue in our heads that narrates our lives. Are we always our most honest narrators? It’s why art forms which use no words are necessary and valuable. Matthew Bourne, known for his radical reworking of classic ballet, says dance is telling a story without words. His new project, Sleeping Beauty, has been turned into a gothic romance where Tchaikovsky meets Twilight. 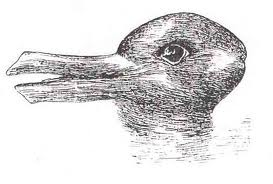 If you think about it, this comment applies to other areas in life as well as the arts – apply it to religion, love, people, the world…remember the ‘duck rabbit’ – which is it, and how do you know? Matthew Warchus, Director of Matilda the musical, said at the Olivier Awards this year that like for the character of Matilda, the creative imagination is the key to surviving life. Matilda escapes her difficult life, where she is persecuted by her parents for her love of reading, by opening a book to access another world that in turn opens her mind. 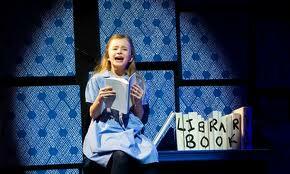 Matilda feels she can be who she is through books. In today’s world, children are encouraged at school to be someone – the trend in life is to become someone – rather than establish who you are: you are already someone! Celebrity, and Reality TV emphasises the need to be someone – to have great expectations that you can do anything. But, what about the everyday person who quietly and genuinely goes about their everyday life – just being themselves – trying to be real. 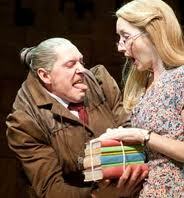 Matilda could be herself, and feel that her realness and indeed her reality, mattered, through her immersion in books. 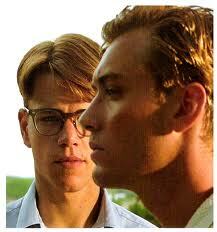 Essentially it is better to be a ‘real nobody’ rather than a ‘fake somebody’ – to steal these two phrases from the film The Talented Mr Ripley spoken by Tom Ripley – Matt Damon (although Tom thinks the reverse and prefers to be a fake somebody). To turn to another artist, Giorgio Agamben, in his book ‘Man Without Content’, thinks that art opens up reality – it opens a space. Art is the space between the melody of everyday life – like a grace note in music. It is where the little bits of truth come in and arrest us from the actuality of life. It reminds us that we are ‘in-between’ this life and possibly something other. Art is the suspension and without this, life is mechanical. Suspension doesn’t mean a rejection or a moving away from real life: a piece of music is not that same piece of music without the grace notes; it is the grace notes – the space – that make the music what it is. A suspension is just a bridge between actuality and possibility, and potentiality. I will hold on to Matilda’s courage at being herself and showing others up through what she loves most: in the end her creativity pushes Miss Trunchball away and inspires others to stand up to the people and powers that crush them. 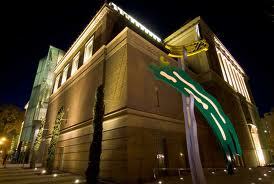 In 2009 I spent some time in Portland, Oregon, volunteering as a Gallery Assistant in the Art Museum there. ‘M.C. Escher and Paradox’ was an exhibition which within the pictures contained the everyday drama of life. Each picture was a stage. On this stage were people in a scene – most of the time not communicating with each other. It reminded me of the world we now live in. The stage of the theatre is a place where people communicate. The stage of life – as in these pictures – is a place where people do not. In this article I wanted to explore the theme of ‘encounter’. Opposites, incongruities and tensions all have to be dealt with and faced and this is something the Church of England is having to do a great deal of at present. 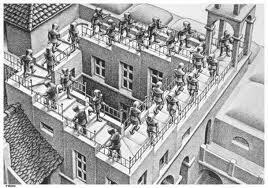 I would venture to take this further and say that the characters in Escher’s pictures represent the divisions in the Church at the moment both internally and with other members of the faith. I want to show that whilst Visual Art is not Theatre per se, it is a presentation of the drama in daily life – whether it is dramatic or un-dramatic is probably down to the viewer to decide. Maurits Cornelis Escher (1898-1972) was a Dutch printmaker who crafted hundreds of prints from woodblocks of impossible worlds, hard to explain without looking at his prints. Yet to look at his worlds they seem logical and neat. The fact is, his worlds are beautiful and perfect to look at but display an uncomfortable tension because of this: the viewer knows they are not. He intermingles different worlds – of sky and earth merging purely by the transformation of shapes where one thing becomes another. To look at the surface of these prints is to see one thing and to look within is to see another as the volume of the print takes hold of you. There are multiple vanishing points as he experiments with depictions of infinity. He suggests possibilities yet never can they be possible…the suggestion of a reality is the itch that keeps you looking at his work since his worlds should be real and yet are dysfunctional. The characters in the impossible worlds are disconnected and unaware of each other. Escher is really saying something here: our world now is impossible because people are these things. The characters in the prints bump into each other because they don’t notice each other – they move in different directions to the same destination but never get there because the structure they are in (and have built) contradicts their chosen path. I cannot help feel how appropriate Escher’s pictures are to our post modern, cranky society – we can’t see how tangled we are because we fail to talk to one another or see the hostile structures we have created (including the boundaries in religion which only we have made) go against our nature. I’d like to quote from the Declaration of Creative Rights by Oregon Poet Kim Stafford, Oregon Arts Summit, May 2009. 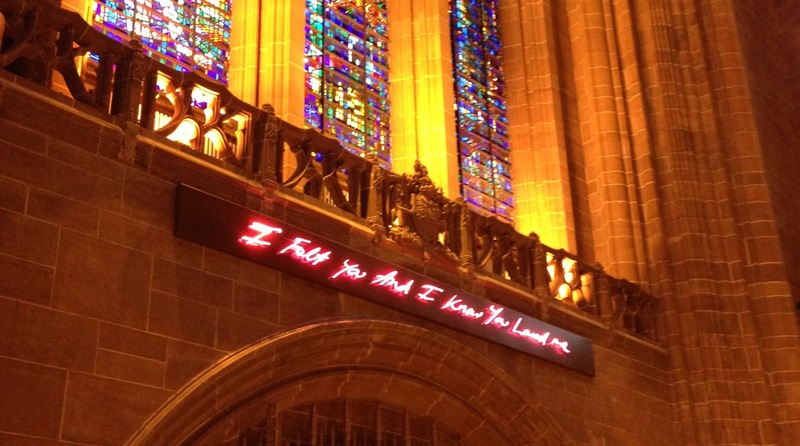 The quote draws the theme of encounter with the other – whether fellow human or God, together with the need to be done through Drama and the Arts. The last line is particularly inspirational. We hold early Creative Experience to be indelible, and that all children need be offered, equally and abundantly, certain Rights that secure access to the formative Encounters of Art—and that among these are making original Work, savoring creative Practice, and the Pursuit of one’s own generous Vision and articulate Voice. At every Stage of our state’s history we have recognized the power of creative citizens to encounter, to consider, and in Good Company one with another to resolve by Insight, Wisdom, and Work together any difficulty that may confront us. And just as a River, in order to thrive in passage through the Tangle of Civilization, must begin pure at its source of Oregon Origin—Applegate, Rogue, Umpqua, McKenzie, Santiam, Chetco, Siuslaw, Trask, Deschutes, Malheur, Grande Ronde, Wallowa—so must a Child begin with pure encounter in the Ways of the Maker, the Inventor, the Architect of personal Image, Craft, Hue, Print, Dance, Drama, Song, and Story. However poetic (hyperbolic, you may say) this is, it does ask us to return to our roots: clearly the artistic ones but I read something grander in the last lines as well. If we become unable to nurture our creative energy, we destroy the Creator in us and shut ourselves off from civilized communication. With the Arts and charities being hit hard in the economic downturn, we should remember that the giving of bank bonuses or the endless amounts of time we spend in our office jobs passing papers around and staring into computer screens, was never and will never be the thing that unites people in life, and that such a self orientated culture was certainly not one we were cut out for.